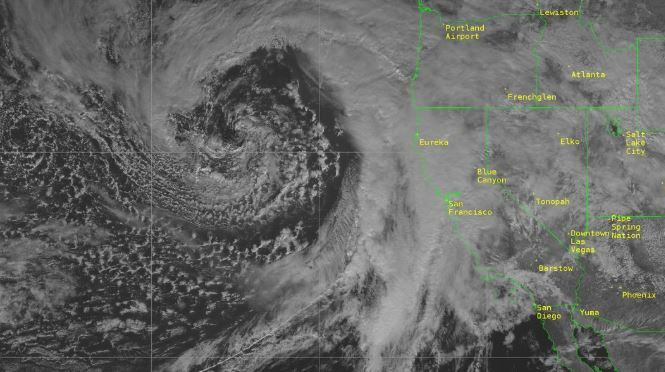 Satellite image from the National Weather Service shows the storm system over California. A final round of rain, possibly the heaviest of the week, is expected in San Diego County Thursday along with high winds in the mountains and high surf at the beaches. As of 9 p.m. Wednesday, the wet weather over the past four days had brought the least rain to San Ysidro — at 0.63 of an inch — while Julian received the brunt of the storms — with 2.24 inches of rain, according to the National Weather Service office in San Diego. Along the coast, Oceanside received 1.35 inches over the four-day span while Brown Field airport in Otay Mesa got 0.65 of an inch, Carlsbad received 0.88 of an inch and the San Diego International Airport was doused by 0.67 of an inch. Across the inland valleys, Fallbrook — at 1.72 inches — got the most precipitation for the period, followed by Santee with 1.5 inches, while the highest total for the local deserts was 0.87 of an inch, in San Felipe, east of Julian. Coastal areas could get up to four-tenths of an inch Thursday, while inland valley-areas could see anywhere from three-tenths of an inch to three- quarters of an inch and the local deserts are expected to get around one-tenth of an inch, according to the weather service. Up to 1.25 inches is forecast for Palomar Mountain, Julian could receive up to nine-tenths of an inch of rain and around a half-inch is predicted for Alpine. The weather service issued a wind advisory for the county mountains that is set to last from 7 a.m. Thursday to 7 a.m. Friday. A high surf advisory will go into effect at 2 p.m. Thursday and last through 4 a.m. Saturday. The final storm system is expected to leave the region by Thursday evening and dry weather with warmer temperatures will prevail from Friday afternoon through next week, forecasters said.